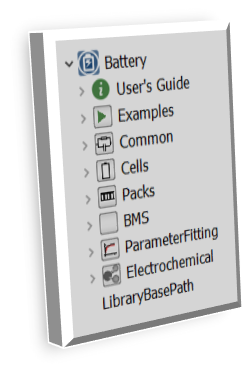 The Battery Library contains components for the modelling of cells and battery packs in a wide range of applications, including automotive, aerospace, industrial equipment and process industry. 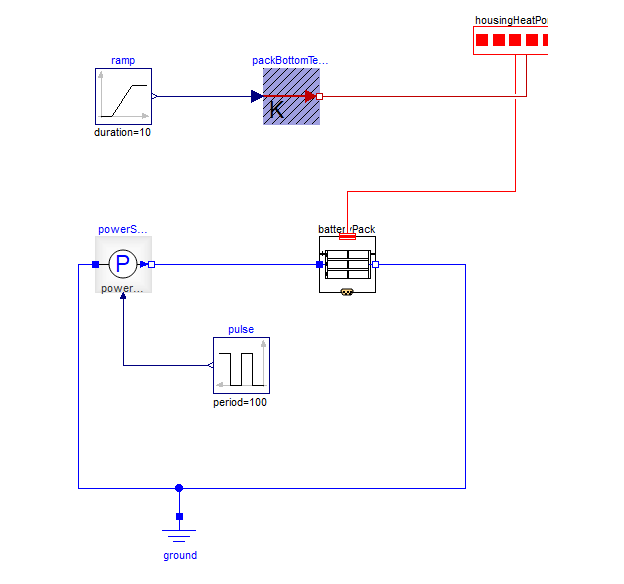 The system simulation approach of the Battery Library allows to gauge effects inside the storage system. Temperature and voltage spreads across battery cells due to variation of cell parameters, start values or boundary conditions can be analyzed efficiently. The performance of battery systems can be calculated including thermal and aging effects. The Battery Library is tailored to model cells and battery packs for a broad range of applications. The library can be used to model a variety of different cell types and aid in dimensioning, battery system performance studies under varying temperatures, ageing studies, as well as control system development and evaluation. The library is divided into a number of sub-packages for different component types. The Cells package contains the packages for the electrical, thermal and aging models and subcomponents. Various examples for battery pack models can be found in the Packs package as well as the thermal models for housing. The BMS package contains an example of a battery management system as well as its various subcomponents. The Electrochemical package contains electrochemical models predicting the spatially distributed behavior of the essential states of the battery.